Offering you a complete choice of products which include wet drum magnetic separator. Ours is an illustrious organization, which is engaged in manufacturing and supplying quality Wet Drum Magnetic Separator. All our products are designed and manufactured in accordance with international quality norms. These products are widely used in cement work, food, chemical industry, foundry, coal mines, domestic waste cycling plants and material processing. 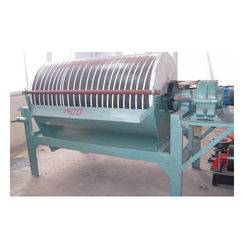 Looking for Wet Drum Magnetic Separator ?